Sorry I missed you all yesterday. I took a nasty spill on the ice Friday night and smashed my knee. Recuperated with the caramel apple oatmeal yesterday! 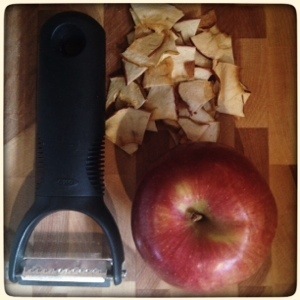 From time to time I’m going to post recipes for some of the toppings that I use in the oatmeal recipes. I make everything from scratch and use as many organic and non-GMO ingredients as possible. 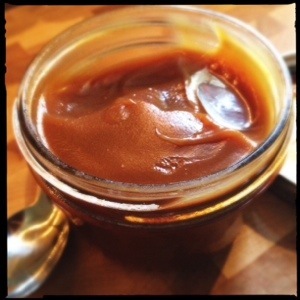 I make caramel sauce fairly regularly and keep it in the frig. I use raw sugar to make it, along with organic cream. Because I make a dark caramel it has a nice full flavor and you only need to use a little to enjoy the flavor. Combine sugar and water in a heavy bottomed saucepan and heat to boiling. Allow sugar syrup to boil until all water has evaporated and syrup turns a dark amber. Don’t stir it and do not leave the pot unattended. Remove from the heat and VERY SLOWLY whisk in the cream. The sauce will bubble up violently. Don’t let it scare you, just add the cream a tiny bit at a time till you get used to this process and keep whisking. Return to heat, and whisk till completely smooth. Pour into clean, wide-mouth 1/2 pint jars (makes 2 pints).